It all started in 2013 when I was frantically looking for a nice tangerine male to improve my tangerine line. Despite knowing a lot of world renowned breeders I hadn’t found what I was looking for and my dearest friend and partner Lydie Verger –Didiegecko Aft, kindly offered me one of her hatchlings, a really nice looking Mandarin Tangerine male named Noir Désir (“Black Desire” in French). This male hatched out of a superb looking Mandarin Tangerine pairing with practically full Carrot Tails. It was very obvious that this male, Noir Désir, had the same qualities as its parents but a different, much darker overall look. The most intriguing for sure were his eyes. They were totally black and the eye expression seemed different than usual. 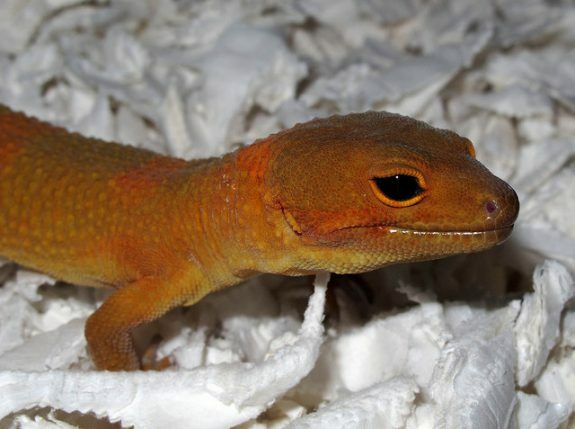 As the gecko hadn’t been expressing any characteristic phenotype of Eclipse genetics other than the black eyes, I spoke to Didie and told her that we might have something new on our hands. We decided to test breed it with a RAPTOR female to make sure, first of all, that it was not Eclipse, and second, that it was het free of Tremper Albino. 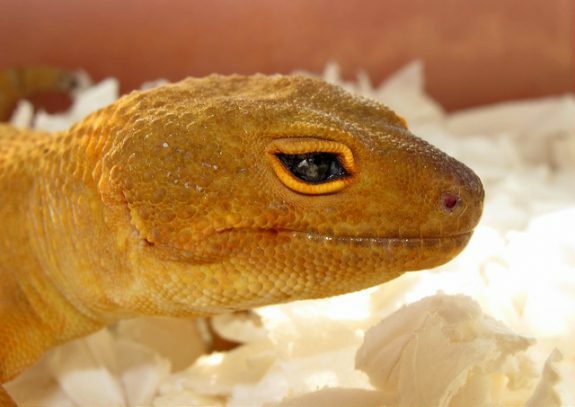 A year later the test with the RAPTOR female proved negative: all the offspring produced were Normal –Tangerines, neither showing visible signs of Eclipse nor Tremper traits. It all suggested that the Noir Désir eye trait should be a simple recessive gene but we had to wait yet one more year to see what would result from pairing the Noir Désir male with F1 generation offspring. At the time it came to my attention that the eyes of the male had changed and the black had diffused so they were no longer all black. 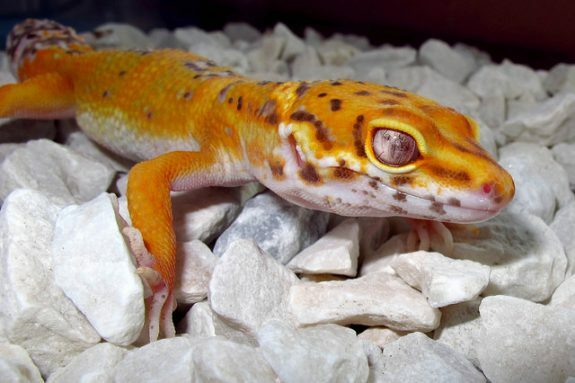 This kind of eye coloration in Leopard Geckos was somewhat similar to the Marble Eyes trait which raised some questions as to whether it could actually be the Marble Eyes. It seemed at that point that we needed to do one more test pairing (Noir Désir eyes x Marble Eyes) which we carried out later (see below). The male was mainly used for breeding with other Mandarin Tangerines and some other well known tangerine lines that I had in the setups as well with some of our best Tangerine Bell Albinos. In 2015 we started hatching out the babies of the Mandarin Tangerine Noir Désir Black Eyes (in short MTNDBE) from different pairings: Mandarin Tangerine Noir Désir (father – P1) with Mandarin Tangerine or Mandarin Tangerine Cross (daughters – F1) which were not expressing black eyes but were obviously hets for NDBE. Such results have confirmed our belief that this new morph is a simple recessive trait. Our further observation of the babies showed that the majority of MTNDBE babies are hatching darker than their clutch mates or other hatchlings from the same pairings. With each shed they were getting darker and also the tangerine coloration was improving significantly and becoming very dark orange. 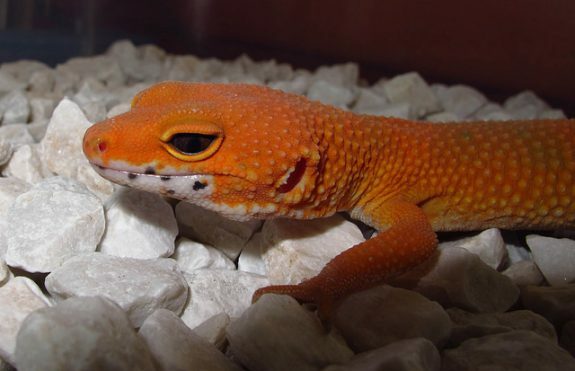 Much of this is due to impressive Mandarin Tangerine genetics but also proving that Noir Désir genetics is interacting with melanism in Leopard Geckos. The easiest way to recognize MTNDBE babies was when they appeared darker than the clutch mate and when they had their typical semi-closed eye expression. With the development of the babies we have realized that eyes could vary greatly in the amount of black from being full black, diffused black and also what we call “MTND Moon Eyes”. At the end of the 2015 season we were really excited to see the hatching of the first Albino version of MTNDBE, more correct Mandarin Tangerine Noir Désir Bell Albino, from the pairing Mandarin Tangerine Cross het Bell het NDBE x Mandarin Tangerine Cross het Bell het NDBE. 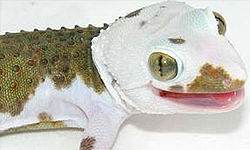 The gecko was showing some typical MTND characteristics such as overall darker appearance with bands and the typical MTND eye expression. 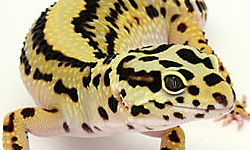 The eyes were something that we hadn’t seen so far with Leopard Geckos, showing a much expanded eye pupil. 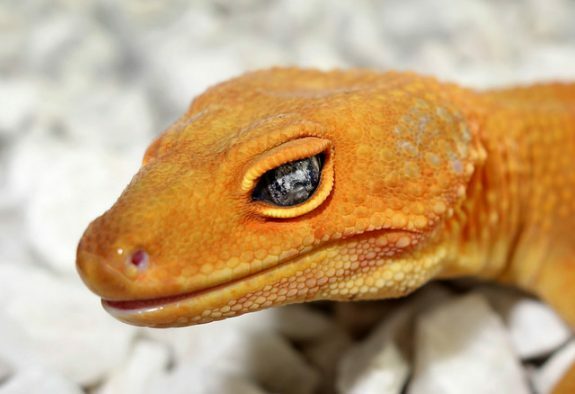 It was noticed that MTND baby’s eyes vary in sensitivity to bright light and that this could change as the gecko matures and becomes less sensitive to the bright light at the adult stage. 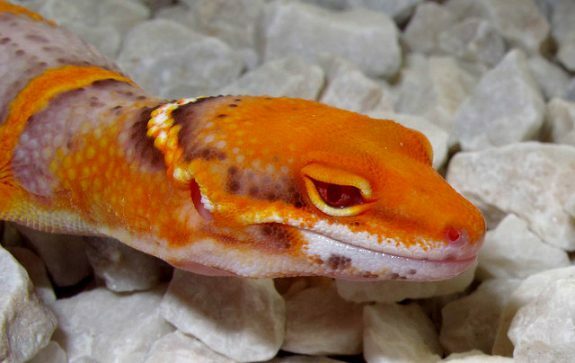 Further observation of all MTND geckos showed that some hatched with each eye looking different, for example one “Moon Eye” and the other “Classic” MTND look. 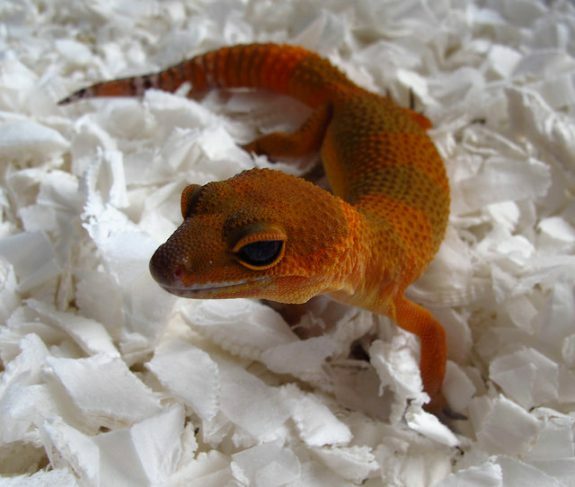 In May of 2016 we hatched the first gecko from the test pairing of SHT Marble Eye with Mandarin Tangerine Noir Désir. 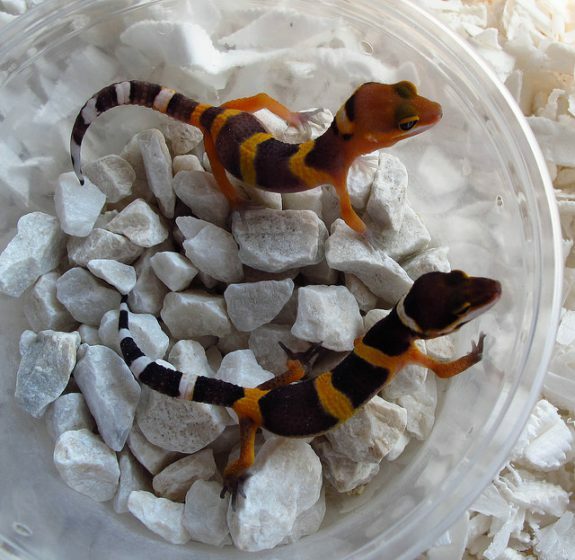 The gecko that hatched out of this pairing was a normal looking gecko – Mandarin Tangerine Cross double het Noir Désir het Marble Eye, proving that these two traits are not connected at all. 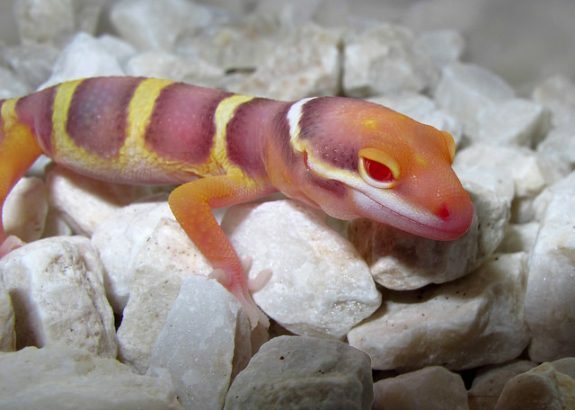 Some days later we hatched a gecko from the pairing Mandarin Tangerine het Noir Désir het Tremper x Mandarin Tangerine Enigma het Noir Désir het Tremper which proved to be the first MTND Enigma. 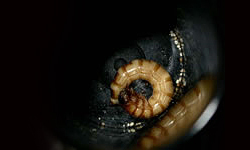 The baby was a bit darker than other Enigmas that we hatched from this and similar pairings and the eyes were darker as well. On June 1, 2016 we hatched the first MTNDBE out of the pairing of two MTNDBE parents. 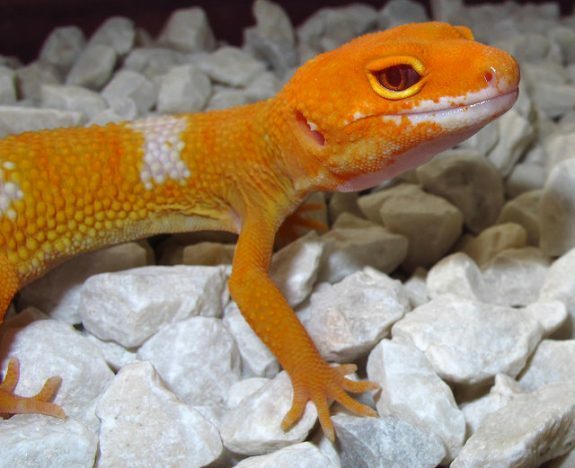 Perhaps nothing out of the ordinary, but one more confirmation for us of the stability of the MTNDBE gene, and also the day when we decided to make the official announcement of Noir Désir as a new recessive trait and morph with the Leopard Geckos. In July of 2016, out of the many pairings of Mandarin Tangerine possible double hets for Noir Désir and Tremper, we had fortune to hatch the gecko that we could positively mark as the first Mandarin Tangerine Noir Désir Tremper. 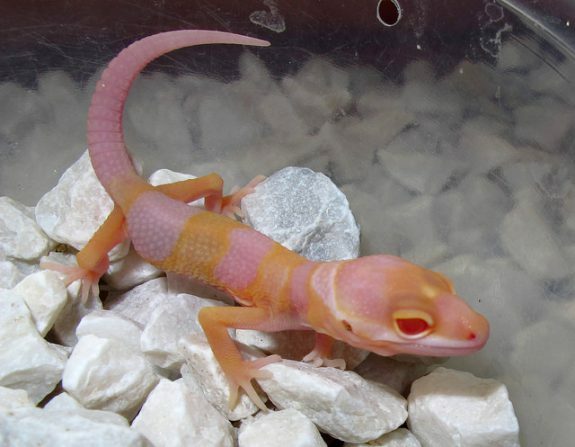 Its eyes pretty much resembled to the ones of the MTND Bell Albino and the development of the gecko was very similar, as well. So far we haven’t seen the “Moon Eye” variation of MTDN Tremper but for sure it is yet to come. 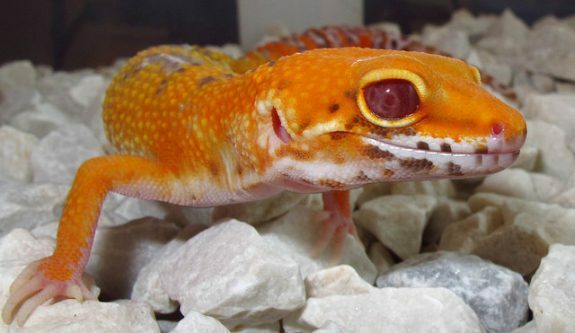 Some of our friends and clients are already working on some interesting projects with Noir Désir genetics and we are positive that we’ll soon hear about some exciting new morph combos in the Leopard Gecko world! 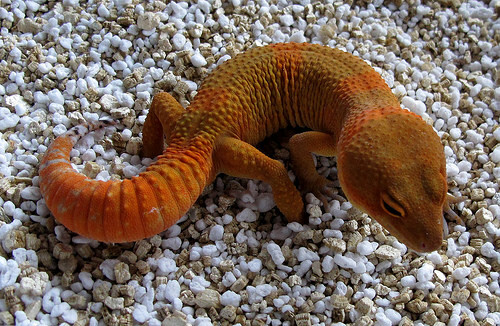 Hi Justin, the geckos with the Noir Desir “Moon Eye” are neither blind or in any kind of pain. Just wanted to say that it’s fantastic to see the test breedings and crosses you’ve been doing. 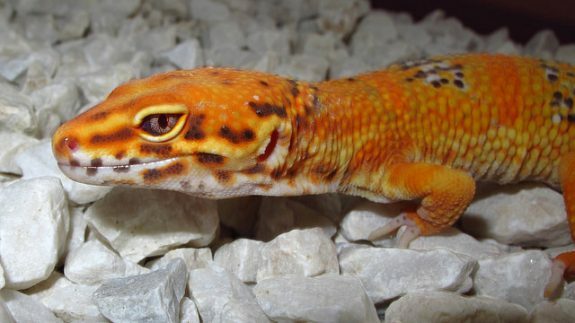 As someone relatively new to leopard geckos, I’ve been so excited to see new genetic traits being revealed over the past couple of years. How do you know if that animals are not blind? I think if the pupiles its gone, with what system does it count? Since there are no ocular receptors.